There's a lot you can do with rules, this article helps you getting the most out of it! Check out our video to get a brief explanation about rules and the four conditions to a rule. 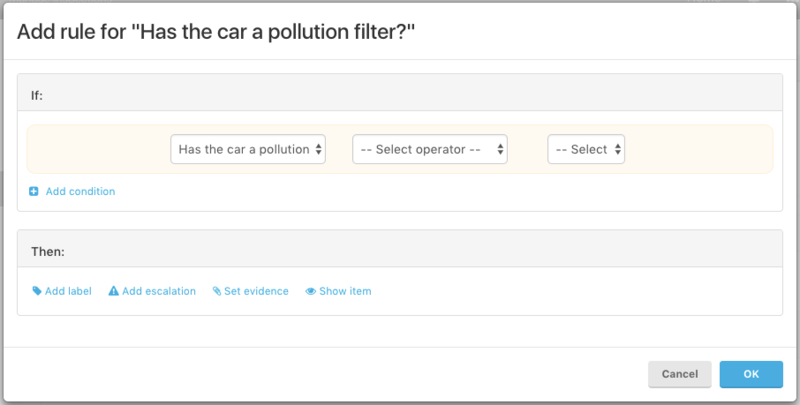 For this article I've created an example question: Has the car a pollution filter? Add a rule to this question by clicking on the + Rule on the right. Add a label: This is to make answers more visual: You can create your own labels and add a color to them. They will show up when a certain answer is given. Labels are also visible in the PDF report. Add escalation: Create an observation out of this answer; meaning the question, answer, added attachments (if any) and the key identifier (if any) will show up as an Observation in the Manage Observations module of the platform. This is for following up on deficiencies. Set evidence: You can make evidence required or not allowed when a certain answer is given. You can set evidence to signature. Show item: Based on an answer you can also show another (mostly a follow up) question. See the example below: I've added all four actions to a single question. This means that if someone answers 'No' to Has the car a pollution filter?